When you’re a people pleaser like me, truthfully replying to a question can be hard. What do you want me to say? runs through my mind before I even formulate my answer. Admitting this is embarrassing. 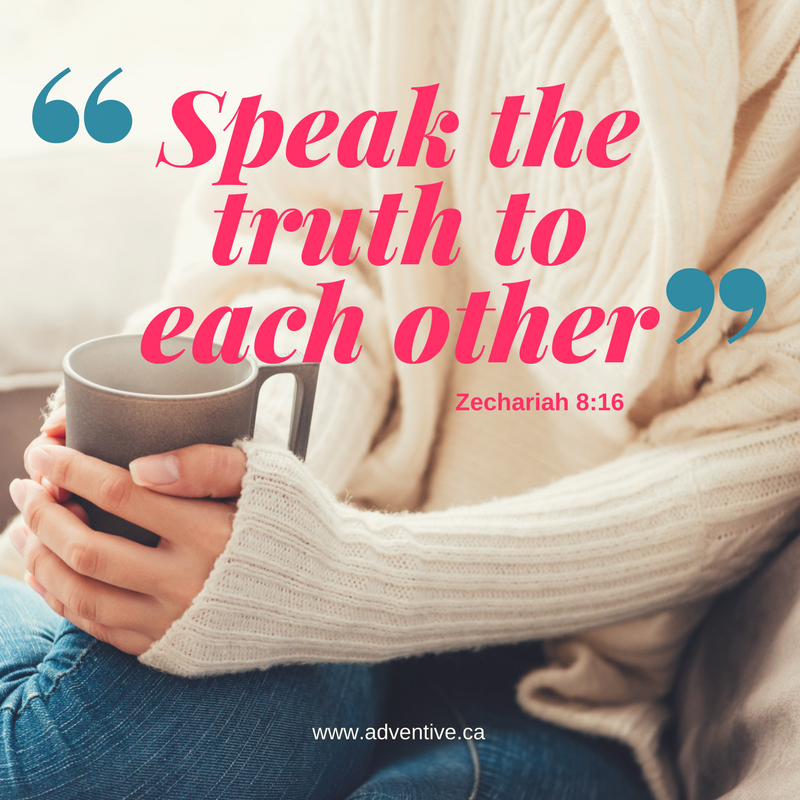 As a follower of Jesus I know what Scripture says: “Speak the truth to each other” (Zechariah 8:16). I don’t intend to be disobedient or dishonest. I just let my fear of offending, disappointing, or hurting the other person get in the way. And I can come up with lots of reasons why this tendency is actually a good thing. After all, we don’t want to be callous or insensitive to the feelings of others. What difference does it make on small issues if I say what the other person wants to hear? Isn’t that better than saying what might be perceived as negative or critical? These rationalizations miss the point. God wants us to be kind and thoughtful, yes. But He also wants us to be truthful. We can reflect both attributes, as He does, by “Speaking the truth in love” (Ephesians 4:15). In all cases, truth is more loving than deceit. We can deliver truth in an unloving manner or with unloving motives, but even then it is less destructive than the alternative – telling lies. “Faithful are the wounds of a friend; but the kisses of an enemy are deceitful” (Prov. 27:6, KJV). Lies, half-truths, flattery, secrecy, and deceit belong to Satan’s kingdom, not God’s. To use any of his tactics, even with “good intentions,” identifies us with him rather than the holy One we love and serve. God cannot lie (see Numbers 23:19, Hebrews 6:18). It is outside of His nature. If we desire to be conformed into His image we must learn to love truth, even when it hurts, is inconvenient, or doesn’t give us what we want. “If we claim to have fellowship with Him yet walk in darkness, we lie and do not live by the truth” (1 John 1:6). People pleasers can learn from Jeremiah. When God sent him out to be a prophet to Israel, He told him not to worry about how people received him or his message. “Say whatever I command you; do not be afraid of them, for I am with you” (Jeremiah 1:7-8). God knew that if Jeremiah let their reactions affect him, he couldn’t be God’s faithful messenger. He needed to fear God more than he feared men. For “Fear of man will prove to be a snare” (Proverbs 29:25). It will trip us up, bind us, and prevent us from freely living the life God intends for us. In my life I’m seldom faced with such a momentous assignment as Jeremiah was given. The kinds of answers others seek from me are far more inconsequential – like whether their new haircut suits them, what I think of their new furnishings, or my choice of a good restaurant. But it’s still important to God that I speak truthfully. We’ve already touched on two reasons: to reflect His character and to avoid being tripped up by a fear of man. But there’s another reason as well. The building of trust. When our oldest son was eight years old he asked his grandmother: “Are you true?” She didn’t know where his question came from and wasn’t sure how to respond. But after we reflected on it together we decided he was asking if he could trust her. He wanted to know if she was trustworthy, someone he could depend on to act in his best interest. The rider on the white horse in Revelation 19:11 was called Faithful and True. The armies of heaven followed him into battle, knowing he could be trusted. In life we choose those we want to be in relationship with. The ones we can safely give our hearts to are those who will tell us the truth, even if it momentarily disappoints or hurts us. A sincere and honest heart that embraces truth is both rare and precious, both in God’s eyes and among people. We get so used to being dishonest that we don’t even see it as sin. I want to repent of my weakness in this area and learn from Him how to speak the truth in love. Always and in every circumstance. My fear (reverence) of Him instead of men will enable me to make right choices. Being truthful with myself, with others, and with God is a sure foundation that will stand the test of time. Whom I fear and honor will determine how I respond to circumstances, crises, and any kind of question that comes my way. People pleasing may give short-term gratification but it cannot build trust or enable me to grow in the likeness of Christ. Am I true? I want to be! And with God’s help I am determined to leave my people pleasing tendencies behind. Will you join me as we begin a new year? Every word of truth spoken in love is a spot of light that will make a difference in a dark world. As Paul wrote, God’s people are to be “blameless and pure … without fault in a crooked and depraved generation, in which you shine like stars in the universe” (Philippians 2:15).